Now and again I see discussion about the genre tropes that people would like to see less frequently (incidentally, while this link is totally safe, you may not want to click all of the links in the article if you’re at work). I understand where the frustration with the recycling of ideas comes from. The obvious example being the vast number of vampire stories that seem to be written and filmed. I mean, I haven’t even read a vampire story for a good number of years and I’m bleedin’ sick of them. But ultimately, I think that what I dislike more is bad writing. Of course, it is a little disheartening to see second rate tosh being published and pushed on a public ravenous for more vampires/zombies/pirates (or whatever), but surely one should judge each work on its individual merits, rather than because it happens to feature elements that are currently over-exposed? 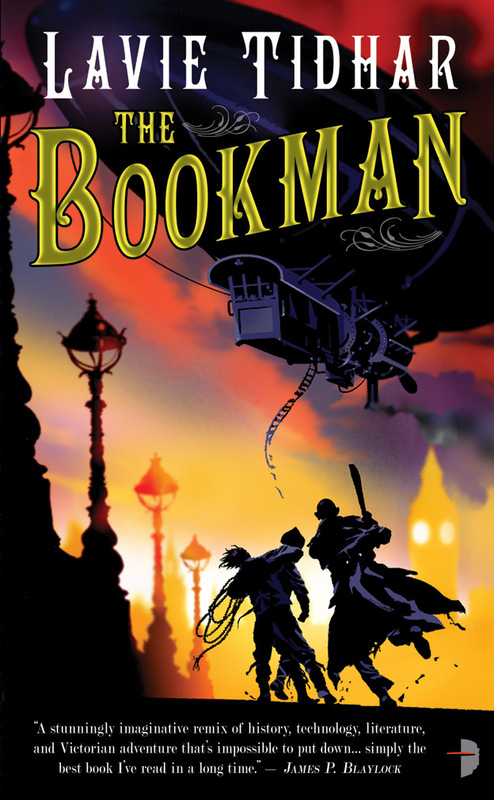 The point of all that rambling is that The Bookman is a steampunk novel. If we’re talking about any trope jumping sharks, then steampunk is probably pretty high up there. But, to judge the book on its own merits, I think that Lavie Tidhar’s foray into steampunk is worthwhile. The novel follows a young poet, Orphan, on his adventures following the loss of his love in an attack by the Bookman, an enemy of the rulers of the Everlasting Empire. It is as straight-forward as that, though there are some revelations along the way (which I won’t spoil here). Incidentally, I don’t think this is necessarily a negative thing. It’s pulpish writing, yes, but I mean that in a good way. It might not be to your particular taste, but it’s done well in this case, and if you’re looking for a good yarn (as I was when I started reading this) you may well enjoy yourself. The Bookman is packed to bursting with the requisite steampunk ideas. Babbage computers, airships and, of course, the British Empire. It also features a smorgasbord of Victorian writers with allusions to both their works and the people themselves. Marx, for example, is known to Orphan, whilst Professor Moriarty is the Prime Minister. Tidhar also makes reference to Coleridge’s work (The Rime of the Ancient Mariner) and the “Persons from Porlock” references a story attributed to Coleridge when he was attempting to finish the poem Kubla Khan. It also demands a certain knowledge of history and earlier literature; Orphan, for example, is described as being half Vespuccian, as what we know as the United States has taken the second half of Amerigo Vespucci’s name. Not only that, but the novel feature pirates and (David Icke will no doubt appreciate this) a royal family that has for several generations comprised giant, intelligent lizards (Les Lézards). The wider needs of the plot deal with this: the mysterious Bookman is opposed to the rule of Les Lézards and the terror that he aims to strike into the heart of the Everlasting Empire is directed at removing the aristocracy from their perch. How much you’ll enjoy the novel does tend to hinge on how palatable you’ll find a novel stuffed to bursting like this. There are a lot of nods to the established tropes of steampunk, there are many historical and literary allusions. If you were to be uncharitable, you might suggest that the approach is somewhat scattergun, or, like me, you may enjoy the character that it gives the novel. There being a lot of this does help the novel; none of the characters really hang about long enough for the reader to dig too deep into their particular motivations, but (and even if you’re not entirely familiar with all the people mentioned), the fact that many of the characters covered in the novel are well known does mean that Tidhar can dispense with introspection and keep the plot moving. This is one of those occasions where I don’t particularly need to know the motivations of Prime Minister Moriarty when he supports the reptilian aristocracy. It’s enough to know that he’s an evil super-genius! The writing itself, though I think it does nod to what one might characterise as Victorian writing, is lean and the plotting efficient. Some elements of this (the Victoriana) may not be entirely to your taste. Naturally, the kind of writing that people tend to enjoy nowadays is not the same as it was in the 1890s. This does tend to mean that one could characterise some of the dialogue – of you take it too literally – as being, well, hammy. If you don’t take it too seriously, though (and I hope I’m not wrong; but I don’t think those elements of the book were supposed to be entirely straight), they add just the right amount of period detail. “The fat man clicked his fingers and a dark suited butler glided over and handed Orphan a drink of his own. He tasted it, found it to be a whiskey much superior to the brand favoured by Jack. He turned his head, feeling the back of his head hurt as he did so. To his right was a window. He looked outside – and saw the city spread out below. It’s not his best; I prefer the novella Cloud Permutations but, potential overload of the steampunk elements aside, it’s well-versed in the sub-genre and clatters along at a good pace, so I really can’t fault it for that. At no point did I find this book dull (and finished it in a couple of sittings) so I think it was successful. Well-worth reading for fans of the genre. This entry was posted in Review and tagged lavie tidhar, lizards, pirates, sf, steampunk. Bookmark the permalink.